The nickname "Charles the Fat" (Latin Carolus Crassus) is not contemporary. It was first used by the Annalista Saxo (the anonymous "Saxon Annalist") in the twelfth century. There is no contemporary reference to Charles's physical size, but the nickname has stuck and is the common name in most modern European languages (French Charles le Gros, German Karl der Dicke, Italian Carlo il Grosso). His numeral is roughly contemporary. Regino of Prüm, a contemporary of Charles's recording his death, calls him "Emperor Charles, third of that name and dignity" (Latin Carolus imperator, tertius huius nominis et dignitatis). Charles was the youngest of the three sons of Louis the German, first King of East Francia, and Hemma from the House of Welf. An incident of demonic possession is recorded in his youth, in which he was said to have been foaming at the mouth before he was taken to the altar of the church. This greatly affected him and his father. He was described as: "… a very Christian prince, fearing God, with all his heart keeping His commandments, very devoutly obeying the orders of the Church, generous in alms-giving, practising unceasingly prayer and song, always intent upon celebrating the praises of God." In 859, Charles was made Count of the Breisgau, an Alemannic march bordering southern Lotharingia. In 863 his rebellious eldest brother Carloman revolted against their father. The next year Louis the Younger followed Carloman in revolt and Charles joined him. 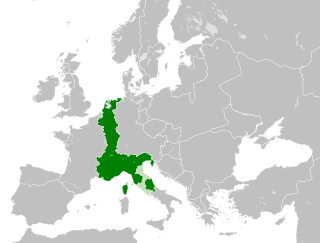 Carloman received rule over the Duchy of Bavaria. 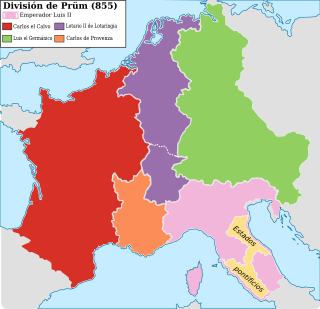 In 865 the elder Louis was forced to divide his remaining lands among his heirs: Duchy of Saxony (with Duchy of Franconia and Duchy of Thuringia) went to Louis; Alemannia (Duchy of Swabia with Rhaetia) went to Charles. Lotharingia was to be divided between the younger two. In 876 Louis the German died and the inheritance was divided as planned after a conference at Ries, though Charles received less of his share of Lotharingia than planned. In his charters, Charles' reign in Germania is dated from his inheritance in 876. Empire under Charles in 887. In February 882, Charles convoked a diet in Ravenna. The duke, emperor, and pope made peace and Guy and his uncle, Guy of Camerino, vowed to return the papal lands. In a March letter to Charles, John claimed that the vows went unfulfilled. In 883, Guy, now Duke of Spoleto, was accused of treason at an imperial synod held at Nonantula late in May. He returned to Spoleto and made an alliance with the Saracens. Charles sent Berengar against Guy of Spoleto. Berengar was initially successful until an epidemic of disease, which ravaged all Italy, affecting the emperor and his entourage as well as Berengar's army, forced him to retreat. In the early 880s, the remnants of the Great Heathen Army, defeated by Alfred the Great at the Battle of Ethandun in 878, began to settle in the Low Countries. Charles' brother Louis the Younger had opposed them with some success, but he died after a short campaign on 20 January 882, leaving his throne to Charles, who reunited the whole East Frankish kingdom. After returning from Italy, Charles held an assembly at Worms with the purpose of dealing with the Vikings. Armies from the whole East Francia were assembled in the summer under Arnulf, Duke of Carinthia, and Henry, Count of Saxony. The chief Viking camp was then besieged at Asselt. Charles then opened negotiations with the Viking chiefs Godfrid and Sigfred. Godfrid accepted Christianity and became Charles's vassal. He was married to Gisela, daughter of Lothair II of Lotharingia. Sigfred was bribed off. Despite the insinuations of some modern historians, no contemporary account criticised Charles's actions during this campaign. In 885, fearing Godfrid and his brother-in-law, Hugh, Duke of Alsace, Charles arranged for a conference at Spijk near Lobith, where the Viking leader fell into his trap. Godfrid was executed, and Hugh was blinded and sent to Prüm. From 882 to 884, the Wilhelminer War engulfed the March of Pannonia (later March of Austria). Arnulf of Carinthia, Charles's illegitimate nephew, made alliance with the rebel Engelschalk II against Aribo of Austria, Charles' appointed margrave of the region. Svatopluk I, ruler of Great Moravia, agreed to help Aribo and in 884 at Kaumberg took an oath of fidelity to Charles. Though the emperor lost his vassals of the Wilhelminer family and his relationship with his nephew was broken, he gained powerful new allies in the Moravian dux and other Slavic duces of the region. Charles the Fat in the Grandes Chroniques de France. When Carloman II of West Francia died on 12 December 884, the nobles of the kingdom invited Charles to assume the kingship. Charles gladly accepted, it being the third kingdom to "fall into his lap". According to the Anglo-Saxon Chronicle, Charles succeeded to all of the kingdom of Carloman except Brittany, but this does not seem to have been true. It is likely that Charles was crowned by Geilo, Bishop of Langres, as rex in Gallia on May 20, 885 at Grand in the Vosges in southern Lorraine. Although Geilo even developed a special West Frankish seal for him, Charles's government in the West was always very distant and he left most day-to-day business to the higher nobility. Though West Francia (the future France) was far less menaced by the Vikings than the Low Countries, it was heavily hit nonetheless. In 885, a huge fleet led by Sigfred sailed up the Seine, for the first time in years, and besieged Paris. Sigfred demanded a bribe again, but this time Charles refused. He was in Italy at the time and Odo, Count of Paris, sneaked some men through enemy lines to seek his aid. Charles sent Henry of Saxony to Paris. In 886, as disease began to spread through Paris, Odo himself went to Charles to seek support. Charles brought a large army and encircled the army of Rollo and set up a camp at Montmartre. However, Charles had no intention of fighting. He sent the attackers up the Seine to ravage Burgundy, which was in revolt. When the Vikings withdrew from France next spring, he gave them 700 pounds of promised silver. Charles' prestige in France was greatly diminished. Charles issued a number of charters for West Frankish recipients during his stay in Paris during and after the siege. He recognised rights and privileges granted by his predecessors to recipients in the Spanish March and Provence, but especially in Neustria, where he had contact with Nantes at a time when the Breton duke Alan I was known to be powerful in the county of Nantes. It is probable that Charles granted Alan the right to be titled rex; as emperor he would have had that prerogative and Alan's use of the title appears legitimate. A charter dated to between 897 and 900 makes reference to the soul of Karolus, on whose behalf Alan had ordered prayers to be said in the monastery of Redon. This was probably Charles the Fat. I will not tell you [Charles the Fat] of this [the Viking sack of the Abbey of Prüm] until I see your little son Bernard with a sword girt to his thigh. Perhaps Notker was awaiting Bernard's kingship, when Prüm would be avenged. Charles probably abandoned his plans for Bernard and instead adopted Louis of Provence as his son at an assembly at Kirchen in May. It is possible, however, that the agreement with Louis was only designed to engender support for Bernard's subkingship in Lotharingia. In June or July Berengar arrived in Kirchen, probably pining to be declared Charles's heir; he may in fact have been so named in Italy, where he was acclaimed (or made himself) king immediately after Charles's deposition. Odo, Count of Paris, may have had a similar purpose in visiting Charles at Kirchen. On the other hand, the presence of these magnates at these two great assemblies may merely have been necessary to confirm Charles' illegitimate son as his heir (Waiblingen), a plan which failed when the pope refused to attend, and then to confirm Louis instead (Kirchen). With Charles increasingly seen as spineless and incompetent, matters came to a head in late 887. In the summer of that year, having given up on plans for his son's succession, Charles received Odo and Berengar, Margrave of Friuli, a relative of his, at his court. He may have accepted neither, one, or both of these as his heir in their respective kingdoms. His inner circle then began to fall apart. First, he accused his wife Richgard of having an affair with his chief minister and archchancellor, Liutward, bishop of Vercelli. She proved her innocence in an ordeal of fire and left him for the monastic life. He then turned against Liutward, who was hated by all, and removed him from office, appointing Liutbert (archbishop of Mainz), in his place. In that year, his first cousin once removed, Ermengard of Provence, daughter of the Emperor Louis II and wife of Boso of Provence, brought her son Louis the Blind to him for protection. Charles confirmed Louis in Provence (he may even have adopted him) and allowed them to live at his court. He probably intended to make Louis heir to the whole realm and the imperium. On 11 November, he called an assembly to Frankfurt. While there he received news that an ambitious nephew, Arnulf of Carinthia, had fomented a general rebellion and was marching into Germany with an army of Bavarians and Slavs. The next week saw the collapse of all his support in East Francia. The last to abandon him were his loyal Alemanni, though the men of Lotharingia never seem to have formally accepted his deposition. By 17 November, Charles was out of power, though the exact course of events is unknown. Aside from rebuking his faithlessness, he did little to prevent Arnulf's move—he had recently been ill again—but assured that Bernard was entrusted to his care and possibly Louis too. He asked for a few estates in Swabia on which to live out his days and thus received Naudingen (Donaueschingen). There he died six weeks later, on 13 January 888. The Empire fell apart, never to be restored. According to Regino of Prüm, each part of the realm elected a "kinglet" from its own "bowels"—the bowels being the regions inside the realm. It is probable that Arnulf desired the whole empire, but the only part he received other than East Francia was Lotharingia. The French elected Odo, although he was opposed at first by Guy III of Spoleto, who also opposed Arnulf in Lotharingia. Guy sought the kingship in Italy after his failures in Francia, despite Berengar having already been crowned. Louis was crowned in Provence, as Charles had intended, and he sought the support of Arnulf and gained it, probably through supplication to him. Odo would eventually submit to Arnulf's supremacy as well. 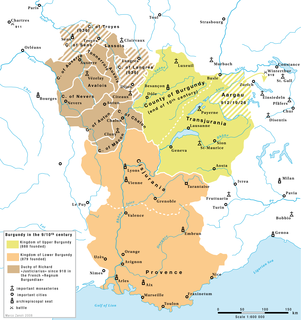 In Upper Burgundy, one Rudolph, a dux of the region, was elected as king in a distinctly non-Carolingian creation, probably the result of his failure to succeed in the whole of Lotharingia. In Aquitaine, Ranulf II declared himself king and took the guardianship of the young Charles the Simple, the Carolingian heir to the West, refusing to recognise Odo's election. It is unknown if these elections were a response to Charles's East Frankish deposition or to his death. Only those of Arnulf and Berengar can be certainly placed before his death. Only the magnates of the East ever formally deposed him. He was buried with honour in Reichenau after his death and the Annales Fuldenses heap praises on his piety and godliness. Indeed, contemporary opinion of Charles is consistently kinder than later historiography, though it is a modern suggestion that his lack of apparent successes is the excusable result of near constant illness and infirmity. Charles was the subject of a hortative piece of Latin prose, the Visio Karoli Grossi, designed to champion the cause of Louis the Blind and warn the Carolingians that their continued rule was not certain if they did not have "divine" (i.e. ecclesiastical) favour. Wikimedia Commons has media related to Charles the Fat. ^ a b AF, 875 (p.77 and n8). ^ Chris Wickham (1981), Early Medieval Italy: Central Power and Local Society, 400–1000 (Macmillan), 169. ^ a b AF(B), 883 (p 107 and nn6–7). ^ MacLean, pp 166–168, quoting Regino of Prüm. ^ a b Reuter, 116–117. AF(M), 885 (pp 98–99 and nn6–7) and AF(B), 885 (p. 111 and n2). ^ AF(B), 887 (p. 113 and nn3–4). ^ Agnes Baillie Cunninghame Dunbar (1905). A Dictionary of Saintly Women. 2. Bell. p. 186. Charles suffered excruciating pains in his head, and attributed it to some sort of diabolic possession, for which he was exorcised, but the pain continued. Then he had incisions made in his head to get rid of the devil, but the pain only grew worse. Among other delusions, he suspected his wife of misconduct with Luitward, bishop of Vercelli. She demanded to clear her character, either by having a champion to fight for her or by some other ordeal. The trial consisted of the accused being wrapped in linen cloth soaked with inflammable liquid and set on fire at the four corners. It was burnt away to nothing, and the innocent queen remained unhurt. Thus was her innocence proved. Airlie, Stuart. "‘Sad stories of the death of kings’: Narrative Patterns and Structures of Authority in Regino of Prüm's Chronicle." In Elizabeth M. Tyler and Ross Balzaretti (eds. ), Narrative and History in the Early Medieval West, pp. 105–32. Brepols, 2006. Arnulf of Carinthia was the duke of Carinthia who overthrew his uncle, Emperor Charles the Fat, became the Carolingian king of East Francia from 887, the disputed King of Italy from 894 and the disputed Holy Roman Emperor from February 22, 896 until his death at Regensburg, Bavaria. Carloman was a Frankish king of the Carolingian dynasty. He was the eldest son of Louis the German, king of East Francia, and Hemma, daughter of a Bavarian count. His father appointed him margrave of Pannonia in 856, and upon his father's death in 876 he became King of Bavaria. He was appointed by King Louis II of Italy as his successor, but the Kingdom of Italy was taken by his uncle Charles the Bald in 875. Carloman only conquered it in 877. In 879 he was incapacitated, perhaps by a stroke, and abdicated his domains in favour of his younger brothers: Bavaria to Louis the Younger and Italy to Charles the Fat. The Treaty of Mersen or Meerssen, concluded on 8 August 870, was a treaty of partition of the realm of Lothair II (Lotharingia), by his uncles Louis the German of East Francia and Charles the Bald of West Francia, the two surviving sons of Emperor Louis I the Pious. 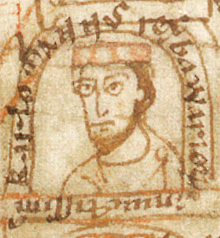 Zwentibold, a member of the Carolingian dynasty, was the illegitimate son of Emperor Arnulf. In 895, his father, then king of East Francia, granted him the Kingdom of Lotharingia, which he ruled until his death. After his death he was declared a saint and martyr by the Catholic Church. Berengar I was the King of Italy from 887. He became Holy Roman Emperor after 915, until his death in 924. He is usually known as Berengar of Friuli, since he ruled the March of Friuli from 874 until at least 890, but he had lost control of the region by 896. Godfrid, Godafrid, Gudfrid, or Gottfrid was a Danish Viking leader of the late ninth century. He had probably been with the Great Heathen Army, descended on the continent, and became a vassal of the emperor Charles the Fat, controlling most of Frisia between 882 and 885.